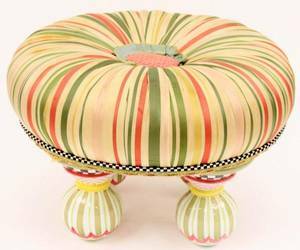 Mackenzie Childs whimsical upholstered circular ottoman or tuffet with green, pink and light gold striped silk tafetta fabric with light blue ribboned accent encircling a large pink button with diaper patterned fabric. Upholstered seat or stool with black and white checkered piping above green, pink and sand colored accent trim. Ottoman raised on four painted pottery legs with checkered, striped and dotted motif with round ball form feet. Metal label from maker underneath. Height 14.25", diameter of round cushion 20.5".